and she is excited to assist you in planning a WOW Event! For months, Genevieve Nisly and I have been planning a one of a kind event for Brides. Our Bridal Soiree will be held on Wednesday January 27th, 7:00 pm at Brookside Country Club in Canton, Ohio! We have teamed with the areas top wedding professionals to showcase area talent and create a relaxed, fun evening for Brides. We are creating four different “weddings” – tablescapes, florals, lighting, cakes, linens, couture paper products, etc. Brides can mingle with the areas best while enjoying refreshments. Take away ideas, tricks of the trade, or just have a fun night out. 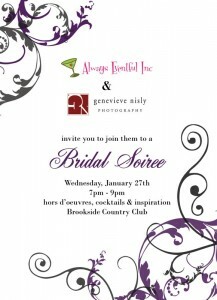 Some of the professionals joining Genevieve and myself for the Soiree – Neil Leeson Decor and Floral, L’nique Linens, Paper Allure, 2nd Mile Productions, Scott Jones from Jerry Bruno Productions, West Side Bakery, Abbotts Bridal, Event Lighting, and Be Seated Rentals. This is an exclusive night that you will NOT want to miss. More information on how to register will be published in the very near future, there will be limited attendance, so check back often! Genevieve has also blogged about our Soiree, so check out what she has to say! This entry was posted on Tuesday, December 15th, 2009 at 5:13 pm	and is filed under Announcements. You can follow any responses to this entry through the RSS 2.0 feed. Both comments and pings are currently closed.